Boulder Colorado based startup Orbotix Has been working on their smartphone controlled ball called Sphero for the better part of the last two years. The company had a working prototype at the International Consumer Electronics Show in 2011. Last Fall they started filling their preorders. These days they are continuing to support their developers in bringing fun interactive apps to the ball. An iPhone or Android can control the $130 ball. Through a smartphone app you can drive the ball, rotate the ball and play games like golf, and drive the cat absolutely crazy. One of the most fun things to do with the ball is drive it down the sidewalk and watch the people’s reaction. That’s exactly what President Obama did with the ball. He had originally noticed someone else controlling the ball. Obama remarked how cool the ball was and of course they let him try it. “Excuse me — give me some space to drive my ball,” Obama said to the crowd of onlookers before taking control of the ball via iPhone, reports the DenverPost. 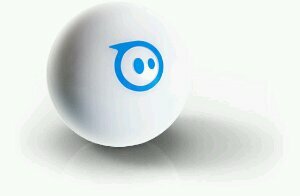 Sphero joins a host of other smartphone controlled toys. Orbotix may have hit the big time with their latest fan.